Somewhere, J.C. Penney is saying “Ooh! Ooh! Pick me!” and B.D. Wong is giving Evan an icy stare. A little hard to relate their initials to careers though, which is what the rest of the theme answers seem to have in common. 23a. [Author who was initially an American League batter?] D.H. LAWRENCE. Before he was an author, he was “initially” a Designated Hitter (the English writer probably got sick of cricket and tried his hand at baseball). 25a. [Sports equipment company co-founder who was initially the head of the DOJ?] A.G. Spalding. Attorney General Spalding. 37a. [Quarterback who was initially a writer of fiction for adolescents?] Y.A. TITTLE. YA stands for Young Adult, which doesn’t quite seem to fit the first two entries since it’s not really a career. “Young Adult Tittle”? 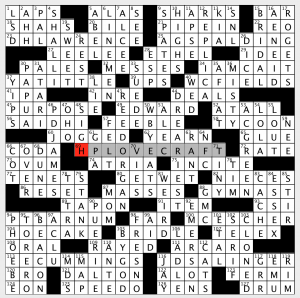 Incidentally, Tittle was just in a NYT crossword a couple of days ago, and it was fun to see his name pop up again so soon. 69a. [Author who was initially a PC technician?] H.P. LOVECRAFT. Hewlett-Packard. This time the initials stand for the name of a company. 94a. [Showman who was initially a health-care worker helping patients regain movement?] P.T. BARNUM. Physical Therapist Barnum. 113a. [Poet who was initially a professional designing power grids and robots?]. E.E. CUMMINGS. Electrical Engineer Cummings. 116a. [Author who was initially a lawyer?] J.D. SALINGER. Pretty sure that stands for Juris Doctor, which is associated with a degree. 46d. [Author who was initially a law enforcement official?] P.D. James. James, who was in the Police Department before taking a stab at a writing career. 50d. [Poet who was initially an executive of the “Felicity” network?] W.B. YEATS. Warner Brothers. This is more in line with the H.P. Lovecraft entry. 53d. [NBA player who was initially a cooling-system repairman?] A.C. GREEN. The “Iron Man” worked on Air Conditioners. While I’m a tad surprised at the inconsistency of how the initials are used (some are companies, some are careers, one is a degree (I think), some are labels, etc. ), I wasn’t much bothered by it. I found it to be a breezy solve with fun cluing. And they all relate to the workforce somehow. 104a. 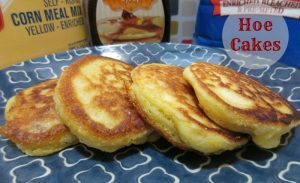 [Cornmeal dish] HOE CAKE. Cuisine I’m unfamiliar with. Looks delish. 109a/90d. Got hung up at the PUERILE/RAYED crossing. Never heard of the former and didn’t know asters are RAYED. Entered a B instead of an R, but quickly fixed it when Mr. Happy Pencil failed to make an appearance. Note that the LEELEE / ALCEE crossing might have been a Natick if not for LEELEE’s careful cluing: [Actress Sobieski with a repetitive first name]. Much appreciated. 3.2 stars from me- I’m interested to see if others were irked by some of the theme inconsistencies. P.S. 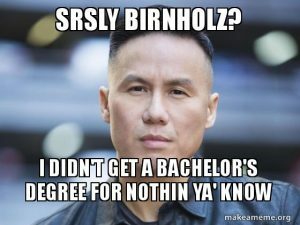 B.D. Wong is having a tough time letting this go. Hello! I swapped days with Amy this week, so you’ve got me today for this fun Patrick Merrell puzzle! 23a, NETWORK FAME [“Anchorman” = ? (1976) + ? (1980)]. Anchorman is a movie about someone who achieves Network / Fame. 28a, SAW NEIGHBORS [“Rear Window” = ? (2004) + ? (2014)]. Rear Window is about a man who Saw / Neighbors. 44a, NOTORIOUS PSYCHO [“Silence of the Lambs” = ? (1946) + ? (1960)]. Silence of the Lambs is a movie about a Notorious / Psycho. 68a, TRAFFIC TOYS [“Transformers” = ? (2000) + ? (1992)]. Transformers, loosely, is a franchise about Traffic / Toys, if we’re counting the plentiful merchandising they’ve done. 77a, TITANIC JAWS [“Jurassic Park” = ? (1997) + ? (1975)]. Jurassic Park is a movie that features some truly Titanic / Jaws. 98a, SIDEWAYS GRAVITY [“Twister” = ? (2004) + ? (2013)]. If we’re being exceedingly generous with the laws of physics, Twister could be described as a movie featuring some Sideways / Gravity. 115a, SUPERBAD HAIR [“Dumb and Dumber” = ? (2007) + ? (1979)]. Dumb and Dumber features some Superbad / Hair. There’s Something About Mary fits this bill, too. 125a, GIANT SPLASH [“The Poseidon Adventure” = ? (1956) + ? (1984)]. The Poseidon Adventure probably features a Giant / Splash (I haven’t seen it, but… how could it not?). A quintessential Patrick Merrell puzzle: the idea is exceedingly cute, and I was excited to figure out each little riddle. There are so many one-word movie titles that it seems like there are a lot of good options (and in fact it was done a couple of years ago in the NYT with a couple of reused movies), but I like the ones Patrick has chosen here. The movies (in the answers and in the clues) are generally very well known, and some of the jokes are pretty funny. In the rest of the fill, I liked seeing GESTALT, EPCOT, USO TOUR, and OSCAR NOD. Not a lot of colorful entries in this one — that’s largely because there was almost no long stuff in this one. Lots of 4- and 5-letter entries, though. Even with 142 words (2 more than the maximum Will usually allows), there was a lot of ugly stuff in this one — enough that I noticed it, anyway. The ones that stuck out to me were NTEST, I BEG, GOEST, ESSE, A TEN, ACT SO, SWA, AAAS, YSER, and AGHA. If Pola NEGRI has to be in the puzzle, it was cute to cross-reference her with the anagram NIGER. The clue for OBESE [Big, big, big] felt really insensitive. Not sure what the thought process there was. 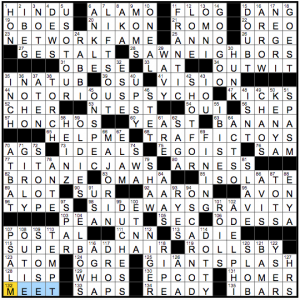 OSU isn’t often a highlight of a puzzle, but the clue was really delightful to me as a Michigan fan: [Big Ten sch. whose mascot is an anthropomorphic nut]. That’s all I’ve got. Enjoy the rest of your weekend — until next time! Sunday is a nice day for a picnic, and we all know there are ants at every picnic. They’re crawling all over this puzzle! 23a [Polite but unyielding statement?] is MADAM, I’M ADAMANT. MADAM I’M ADAM + ANT. 52a [Sign on an available boutique?] is SHOP VACANT. 67a [Serf surrounded by whales?] is PEASANT IN A POD. I would like the Crosswords Powers That Be to decide if the collective term for whales is POD or GAM. 87a [Fort Bragg lodger?] is BASE TENANT (base ten). 99a [Director Oliver to the rescue?] is GALLANT STONE (gallstone). 101a [Never-used part of the house?] is the DORMANT ROOM (dorm room). We spent several hours shopping for Emma’s dorm room today. Then we fed her mac&cheese and chicken fingers, because going to college is stressful. 118a [Godzilla and friends solemnly recite?] is MONSTERS INCANT (Monsters, Inc). I like this theme. It’s consistent in a way that helps fill in the answers without being boring or really predictable, the funny answers are actually funny, and all the base phrases are in the language. Nice! In the “words you don’t see very often” file: 4d [Land adjoining a manor house], DEMESNE, and 69d [Apple or pear], POME. 31a [Bolt of lightning?] is the aptly surnamed USAIN. Are ARRAYS always [Impressive groupings]? 98a [One of a cube’s 12] was obviously SIDE. Wrong. It’s EDGE. Which I should have known. 103d [Type of numeral] is ROMAN, which I prefer to actual Roman numerals in the grid. What I didn’t know before I did this puzzle: that Lee TREVINO won the British Open twice. [23a: Shanty still accreting verses? ]: GROWING SEA SONG. This one splits the base word into two. [38a: Paid Fonda’s tab? ]: COVERED BRIDGET. Noun –> proper name. Bridget Fonda hasn’t been in much lately; my favorite role of hers was probably in A Simple Plan (1998), or going back to my youth, Singles (1992). [69a: Family tie? ]: FRATERNAL TWINE. There’s a superfun web-based platform called Twine that lets you gamify writing to make interactive fiction. Yes, you can make games without knowing any code! I liked this fine, but what would’ve sent it over the line into greatness would’ve been if the added letters added up to something — a word describing the theme or something fun like that. This entry was posted in Daily Puzzles and tagged Emily Cox, Evan Birnholz, Henry Rathvon, Patrick Merrell, Roger & Kathy Wienberg. Bookmark the permalink. My thought on the NYT was that, well, your mileage may vary. Either who know all these movies, including some rather trashy and forgettable ones, or you don’t. But just as much, either the puns both work for you and guide you to a fill when you DON’T know everything by heart, or they don’t. I’m afraid I fall in the latter and still never made much sense of at least half the theme fill without a huge stretch. Still can’t quite justify a few. It’s the problem with going all-in on a specific topic like this. I really enjoyed it but can see how some people wouldn’t. The theme of today’s NYT fell flat for me. In theory it’s a clever idea, but in practice I think it’s just not nearly tight enough (and it would probably be really tough to get a puzzle’s worth of tight theme answers). SIDEWAYS GRAVITY is the worst offender (that one is just a straight-up “nope” for me), but the others start to fall apart if you look too closely as well. GIANT SPLASH? The Poseidon Adventure involves a huge wave, not a “splash”. SUPERBAD HAIR? Seems to focus on a fairly superficial feature of the film. NETWORK FAME? I guess that kinda sorta works, but it’s not what I’d call a particularly apt descriptor of the film. Exactly what I meant, thanks! Everything felt off. 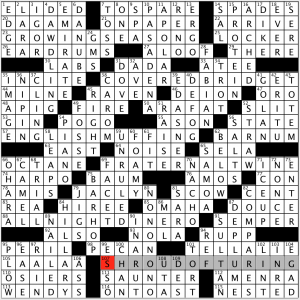 NYT: Although I have seen only three of the movies in the theme answers, I had fun sussing each of them out. NOTORIOUS PSYCHO and TITANIC JAWS made me laugh. I thought Anchorman would be Network Name, so it took me until the second themer to get the idea. It’s always fun to see a fresh (to me) clue for OREO. I liked GOO GOO (I also would have enjoyed a Goo Goo Dolls clue), IBISES (they have red legs – how cool is that? ), and the shoutout to Meghan Markle. Thanks for the Sunday fun! Great puzzle. Even though I knew few of the movies it was fairly easy to figure them out. “Target for an angry chihuahua” was cute and I always like seeing ibises in a puzzle as they are frequently in my yard in the morning. Not many names of people, which is always a plus for me. +1 on the anklebiter clue. Southern central Florida… lots of Ibis, Sandhill Cranes and Storks and other cool birds and butterflies. On the downside, fire ants, Africanized bees, gators and poisonous snakes. There’s always something, isn’t there? A recent scare here in Virginia is giant hogweed. Hmm. That would make an interesting puzzle entry. Also, it’s always been my understanding that MC stands for emcee/master of ceremonies, the core elements of early rap music being a DJ/disc jockey and an MC. Finally an LAT printed version that you don’t need a microscope to read! I liked the whole NYT theme and genuinely laughed out loud at OSU (my wife’s an alum), ANKLE, and SAWNEIGHBORS. Fill was bad but more annoying than frustrating. 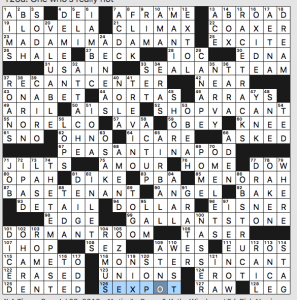 NYT must have been easy since I didn’t have to look up any of the popular culture clues. As a U of M grad I also chuckled at the OSU clue.